Emigration to America was commonplace in the 19th and early 20th centuries. Thousands from Britain and Ireland answered the challenge of seeking a better life overseas, and many of them went to the United States. Your family history research might well find you needing information from America. The good news is that there's plenty of it - probably more than you'll find in Britain. The USA is younger, and in spite of the wild image of its early years, a lot of thorough records were kept, on national and local levels. The sheer size of the country and the migration within it might cause problems for a researcher, but they're all surmountable. 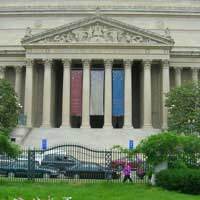 The National Archives are a perfect place to beginThe National Archives carry census records from 1790-1930, immigration records (also known as ship passenger records) from 1820-1982, military service and pensions from 1775-1902 and land records. It also operates regional centres, and stores the records of 22 different agencies. The county courthouse has always been the main repository for documents in the US, certainly before 1900, when many states took over several registration processes. The holdings do vary from courthouse to courthouse, but in general family history research terms you can find birth, marriage and death certificates, divorce and probate records, wills, deeds and land records, voter lists, tax lists, court records and naturalisation papers - a wealth of information in one place! Most states have record repositories, although their titles vary. Sometimes they're called archives, elsewhere records office or state libraries - you'll have to enquire to find out the name in a particular state. You'll also have to check the resource directory to see what they carry. It's possible you can find regional census records, land record, pension records, vehicle registrations, driving licences, law enforcement records, regional court and prison records, cemetery records, regional military records, university and school records and even regional Native American records. This can be an excellent resource, with over 40,000 genealogies and 100,000 local histories and more. However, you'd do best to identify the material you want first, and if you visit, allow ample time - it can take an hour to get the materials to you. The Newberry Library is a privately funded institution on Chicago which has a particular emphasis on genealogy, holding some 17,000 genealogies and many other records, including a great deal of information on colonial America, perfect for those whose ancestors emigrated early. City libraries will have local information. Remember though, that many cities in America are young - the first white settlers to reach Seattle, for instance, only arrived in 1851. You can also find heritage centres in regions or cities that can offer historical documents pertaining to specific ethnic groups in the area. The Family History Library of the Mormons (www.familysearch.org), has an excellent amount of U.S. genealogical information, as you might expect, and is well worth your time online. As always, though, don't take everything you read there as gospel - check against primary sources. But they can offer plenty of direction and help. One boon to genealogists, especially those in other countries, is the presence of local genealogical societies, either by state or by region. You'll have to search online to find one that fits the area you need, but the chances are they'll be willing to help you with your research.